achieved. Let the contest begin...."
separate entry for more details. The games actually fun if you're trying get the overkills and there's some nice fighting styles, but the game comes off as mk meets street fighter but with street fighters graphics and mk's fatality system. Instead of playing this one, get the ultimately better sequel for sega cd. It's actually more fun and has a bunch of characters to choose from, and like 12 hidden characters. 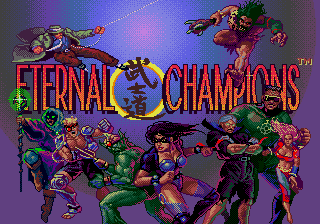 It's funny how hyped up Eternal Champions was, it spawned two crappy spinoffs, one starring Shadow(X-Perts) and one starring Larcen on game gear, I forgot what it was called, but neither game was any good, and neither were fighting games. 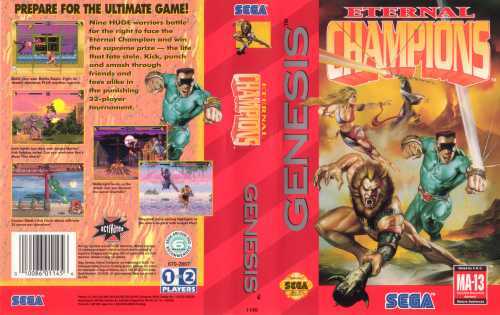 Eternal Champions was going to released on sega saturn but they scrapped it because it was becoming too much like virtua fighter. Anyways, I give the first Eternal Champions a 5. Back in 1992-1993, all the game magazines kept pimping Eternal Champions as a newer and better Street Fighter. Well, when it finally came out, many of use felt burned. The gameplay was extreemly difficult, timing was horrid, graphics were choppy. I had hoped for alot from this game, but was greatly dissapointed. the graphics are there.. but this game is no match to MORTAL KOMBAT! its tooo tuff to play.. well maybe its me.... :( but hey go give it a try! I loved and still love this game. 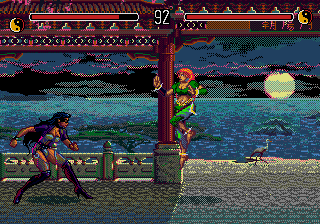 it may be very hard, but it's still one of the best 2-player fighting games on any system IMHO. Not a bad fighting game at all, really. I think most people were disappointed that it was not Street Fighter or Mortal Kombat. One of the big complaints of the game mags at the time was that there were too many options! Or that there was too much character info available! Yeesh, if you don't like the extras, you don't have to bother with them at all. But if you do, this cart is loaded with them! 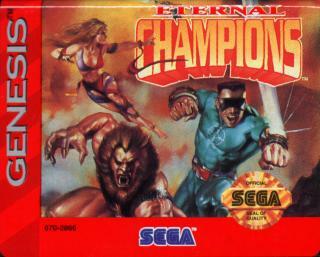 Admittedly, Street Fighter 2 is still the better game but Eternal Champions is definitely worth playing. The main game is your standard versus fighter. Each character has a great range of standard as well as special moves. Combos are not as advanced as in SF2 or MK but still good. You can also do overkills, somewhat like the fatalities in MK though they're a lot easier to pull off. Like MK, they don't really add anything but they can be fun to watch and a great way to taunt a human opponent. The characters in this game are a great mix of superhero and villain types, each with an appropriate set of specials. You can choose from a vampire, a wizard, a futuristic superhero, a 1920's gangster, a ninja, a caveman, and more. Each character also has detailed background info loaded into the cart itself, though you can skip this stuff if you're not interested. Again, this was one of the major complaints against the game at the time, their reasoning being that we slowly learned about Street Fighter or Mortal Kombat over the years. Who cares? Besides, EC was definitely playing catch-up in it's first outing while the others had been around for years. EC also includes a training simulator. This is something like the X-Men's Danger Room, well, for a 2D fighting game. You can choose to train in the room with various obstacles that fly at you or shoot projectiles or laser beams at you. Or you can choose a holographic opponent to fight against. As an added touch, the holographic opponent (one of any of the other characters in the game) will be projected by a small robot that flies overhead. The holo-opponent is semi-transparent looking, too. And when you beat it, the character image disappears and the robot projector falls to the floor! For the ultimate practice, you can even fight a holo-opponent with all the buzzsaws and laser beams firing at you! The SegaCD version literally blows this cart away, though. It has more moves and special moves, more characters, more stages, more sound, cinemas, and more (and more brutal) overkills. Still, if you don't have SegaCD or are using the Nomad, this cart is a fun play. And the training simulator isn't in the SegaCD version, though I still easily recommend the CD over the cart if you have to choose. Swine....................... I've just bought this game off ebay and you all make me not wan't to play it already before it arrives. I'll keep you posted on this one. Panic over - this game is not too bad at all, its not as polished as Street Fighter 2, but it IS a welcome change and not the piece of trash that the majority of this page would have me believe. Me and my girlfriend Louise played on this one for a good few hours - Louise prefered to play as the character she refered to as 'Macman', I cannot recall what his real name is. 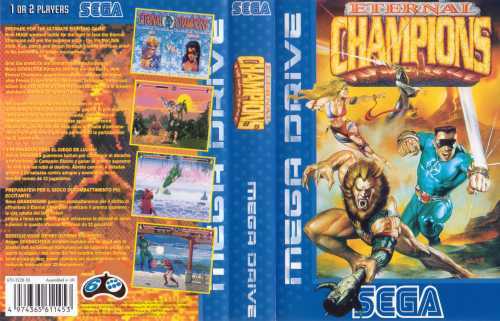 I have this game and I only beat it once with Trident the Eternal Champion is hard!